Frantic Mama: Amazon Prints is REALLY worth the try! $1000 of Amazon Gift Cards to be Won! I'm a big fan of Amazon.com. Amazon and I go way back-- I remember when they just sold books in ye olden days when I was in college. Now you can get just about anything from them, photos included. I'm obsessed with taking photos of my family (and of nature and animals and everything else). The problem with all these digital photos is that they often add up on my phone and camera instead of being printed and organized in a nice album or photo gift we can actually enjoy. Amazon has launched a photo printing service that allows all customers to print their memories. 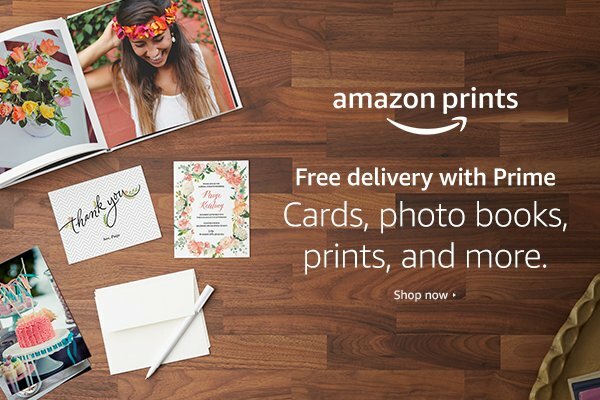 Prime members can upload images to their Prime Photos account, print the product of their choice, and receive free delivery. If you’re not a Prime member, you’ll receive 5 GB of storage free on Prime Photos and be able to print your photos. Prints start as low as $0.09, but I'm a sucker for the photo canvases and photo calendar creation (I give my husband a family photo calendar with our favorite photos each Christmas. He says it's his favorite gift.). I hope one of my readers wins the big cash prize (because naturally my readers are the best!). In the meantime, keep snapping those photos! If you're anything like me, you'd rather have too many than too few :). *Thanks to Amazon for sponsoring this post and providing prizes for the giveaway! **Amazon, Fire, and the Amazon Fire TV logo are trademarks of Amazon.com, Inc. or its affiliates.